On January 19th, the Florida Department of Economic Opportunity released preliminary labor market data for December 2017 and researchers were able to analyze a calendar-years’ worth of employment data for their respective cities. So just how did Orlando stack up in terms of jobs creation for 2017? Orlando ranked the fastest growing large metropolitan area in the country for 2017. While not the largest in terms of total jobs, 3.8 percent employment growth means Orlando is outpacing Riverside, Calif., San Antonio, Austin, Seattle and every other large MSA in America in terms of the number of jobs added this past year relative to their December 2016 starting points. At the same time, Orlando has consistently maintained some of the lowest unemployment rates this past year; lower than both the state and national average. Orlando’s explosive employment growth and ability to maintain such low unemployment rates speaks to the region’s impressive ability to attract new talent from elsewhere in the United States and abroad. Unemployment in the United States is currently the lowest it has been since before today’s high-schoolers were born. Orlando’s capacity to attract and retain talent will become even more important in 2018 as unemployment rates continue to drop and the labor market across the United States tightens. Orlando’s fastest growing industries over the last year have been manufacturing, construction and financial services growing at 13.1, 7.5 and 6.3 percent, respectively. Compared to national levels, Orlando is greatly outpacing the country; manufacturing employment grew at 1.6 percent, construction at 3.7 percent and financial services at 1.5 percent. 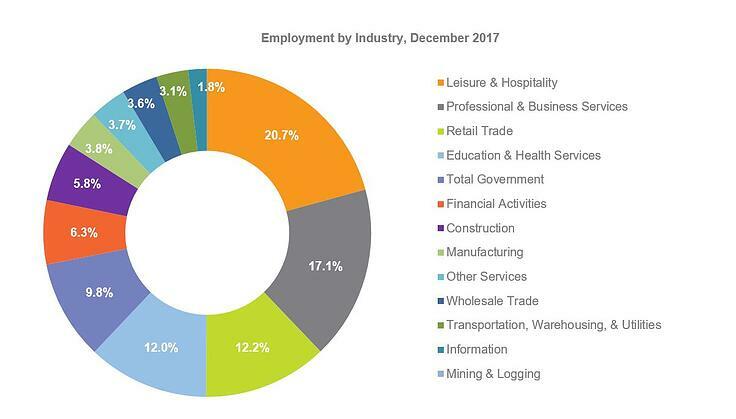 The leisure and hospitality sector grew at 4.3 percent but added the most jobs of any single category (10,900) followed closely by professional and business services. The transportation, warehousing, and utilities sector is the only industry that lost jobs. 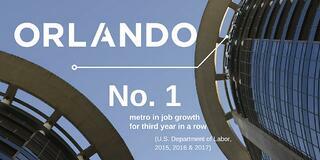 Orlando’s current industry breakdown is shown in the chart below. Armed with this information, IMPLAN’s input/output modeling system estimates the effects of 46,700 new jobs on Orlando’s economy. Assuming that the new jobs added this past year cascade down into industry sub-sectors in a distribution that is consistent with Orlando’s 2016 employment breakdown, the 46,700 new jobs can be assigned to detailed occupation groups. It can be expected that in 2017 an additional $2.2 billion of payroll was added to the labor force, $3.4 billion was added to the gross regional product (GRP), and new state and local tax revenue is set to increase by $236.9 million annually. For example, plastic bottle manufacturing employed approximately 442 people in 2016, making up one percent of all manufacturing jobs in the region. Applying this same percentage to the number of new manufacturing jobs added this past year, it can be estimated that 56 (one percent of the 5,600) new manufacturing jobs were in the plastic bottle manufacturing industry. 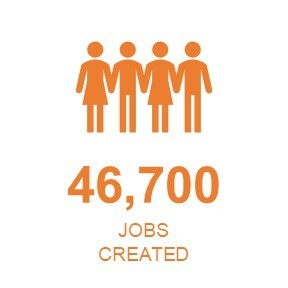 By importing this projected job growth, 43,413 jobs of the 46,700 could be matched across 81 distinct IMPLAN industries. This analysis allows us to then project the impact to payroll, GRP, as well as new state and local tax revenue. Orlando’s regional average wage as of January 1, 2017 was estimated to be $43,532. However, the data suggest that the region is seeing growth in the average wage of its citizens. Using the estimated, new labor income, it can be calculated that $2.2 billion in labor income generated from 43,400 jobs gives an average wage of $51,019 for the jobs added this past year. This finding is supported by the fact that the Orlando regional average wage has been growing faster than the state and nation since the third quarter of 2015 up until the most recent quarter where data is available. Overall, Orlando showed signs of strong employment growth throughout 2017 despite a tight national labor market and an active hurricane season. We expect this progress to continue into 2018 and find the average wage growth to be especially promising.